Fired up Sisira Kumara with a 5 under 66 left others in the shade to make a fitting finale and cruise to victory in the final event of 2017. Sisira with a 4 round total of 278 at 6 under for the tournament made his statement as the current Sri Lankan amateur golfer in the best form. He was a comfortable 6 shots clear of 2nd placed J.M.D. Indika with a total score of 284 leaving Chalitha Pushpika trailing in third place with a total of 289, whilst current top ranked player B.A. Sanjeewa had to be satisfied with 4th place at the end of a very competitive national ranking event that also gives World Amateur golf ranking points. 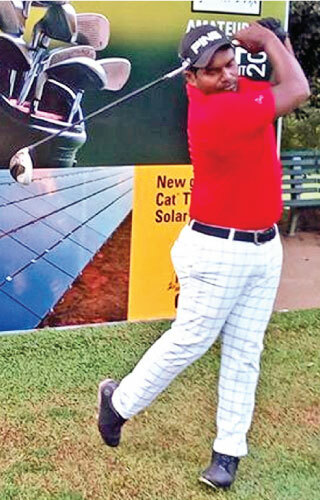 CAT-SOLAR, the title sponsor of the Pin Fernando Golf Grand Prix is proud to have been associated with such quality golf in Sri Lanka as the Sri Lanka Golf Union works towards taking golf to the next level. 1. Sisira Kumara 278, 2. J.M.D. Indika 284, 3. M.H. Chalitha Pushpika 289, 4. B.A. Sanjeewa 292, 5. D.M.P.P. Bandara 296, 6. M.U. Chanaka Perera 298, 7. N. Ranga 303, 8. Rosana Prasad 305, 9. R.Sureshan 306, 10. D.G.D. Danusha Perera 307.